First we need to set up rClone. This is already installed on every box, so we just need to configure it. Enter n to create a new remote. Next, enter any name you want, but for this guide I will use gdrive as an example. Just remember to change it everywhere from now on. Next, enter drive to add a Google Drive account, and press enter on the client id and secret prompts. Now enter n since you are on a headless machine and copy the authorization link into your clipboard and paste it into your browser. On the webpage you have to log in with the account you are planning to use as storage (only important if you have multiple accounts). Now copy the code you are given back into the prompt in your SSH window. Enter y to confirm your settings, and then q to exit the configuration. Test this by entering the directory (cd drive) and creating a file (touch test.txt) and checking in your browser if the file was created. If everything was successful, you can now create a TV Shows directory for Sonarr by entering mkdir TV\ Shows, and using this directory for adding shows in Sonarr. Keep in mind that you have to remount the directory every time the server reboots, which happens very rarely and is probably announced on Bytesized's twitter. 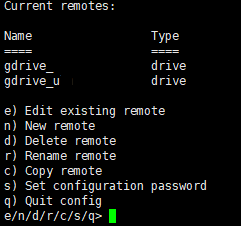 change --output "$HOME/media" to --output "$HOME/rclone_up"
Press CTRL+x followed by y to save and exit. Verify that everything works by adding a show in Sonarr (be careful to select the correct path) and search for any episode. NZBget will print status messages of the upload every 5 seconds, so you can see how long it will take. Finally, check if everything was added correctly in your Google Drive account. If everything worked, simply add the TV Shows folder to the TV library on your Plex Cloud server.